Derek Brassard had a hat trick and Henrik Lundqvist stopped 36 shots in another season-saving performance as the New York Rangers beat the Tampa Bay Lightning 7-3 Tuesday night to force Game 7 in the Eastern Conference finals. 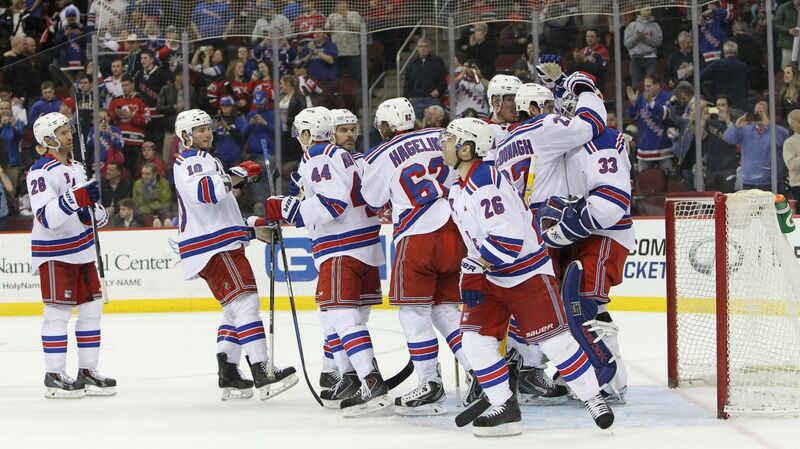 Brassard also had two assists for the Rangers, who evened the series 3-3 after being shut out in Game 5 at home. Keith Yandle, James Sheppard and J.T. Miller also scored on Ben Bishop, who was pulled with New York leading 5-1 with just under 13 minutes remaining. Rick Nash added a power-play goal against Andrei Vasilevskiy and Brassard had an empty-netter with 1:41 to go to complete the hat trick. Lundqvist was outstanding before giving up a pair of third-period goals to Nikita Kucherov. New York improved to 4-0 in elimination games this postseason, and Lundqvist is 9-1 with his team’s season on the line since the start of last year’s playoffs. Game 7 is Thursday night in New York, where Tampa Bay has won twice in this series. Nash finished with a goal and three assists. Yandle had a goal and an assist, and Miller finished with his first goal in 22 career playoffs games, plus three assists. Ryan Callahan scored for Tampa Bay in the first period, but the Rangers did a good job of limiting opportunities for Lightning captain Steven Stamkos, who only got off two shots after scoring in four consecutive games. Brassard scored on New York’s first shot of this game and Yandle’s second goal of the playoffs made it 2-0 at 15:30. That came less than a minute after the Rangers killed off a penalty with help from Lundqvist, who made a nice pad stop on Stamkos to deny the Lightning star from point-blank range. Two former Rangers figured in the Lightning trimming the deficit 2-1, with Callahan – traded to Tampa Bay in exchange for Martin St. Louis last season – skating in alone on Lundqvist after taking a pass from Anton Stralman, who left New York as a free agent last summer. NOTES: Bishop was credited with his second assist of the playoffs on Callahan’s goal. … Stamkos was the first player with a goal in four straight games of a playoff series against the Rangers since Mario Lemieux scored in all five games of the 1996 conference semifinals. The four-game streak also tied a Lightning playoff record set by Martin St. Louis in and matched by Vincent Lecavalier in 2007. … Lightning C Cedric Paquette sat out with an undisclosed injury. … Rangers coach Alain Vigneault said RW Mats Zuccarello, who hasn’t played since getting hit by a puck in the helmet during Game 5 of the first-round series against Pittsburgh, is making progress but is not ready to play.